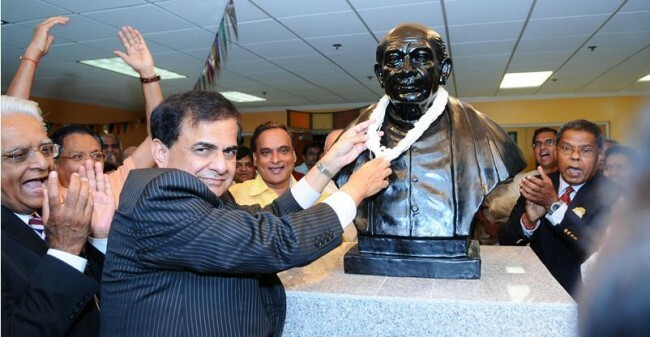 Padma Shri Dr.Sudhir Parikh inaugurates the Bust of Sardar Patel at the Gujarati Samaj Atlanta on 11th September 2010. Atlanta, GA: Vallabhbhai Patel , popularly known as Sardar Patel, was an Indian barrister, a great patriot, a statesman, a senior leader of the Indian National Congress and a founding father of the Republic of India who played a leading role in the country’s struggle for independence and guided its integration into a united, independent nation. Patel was born on 31st October 1875, and raised in a small village in Nadiad, Gujarat. He went to England, became a Barrister and had a very flourishing law practice in Ahmedabad but he gave it all up and joined Gandhi in India’s Independence struggle. His wife Jhaverba passed away in 1909. Patel did not re-marry and raised their daughter Maniben and son Dahyabhai himself and with the help of the family. He was one of the most influential leaders in Gujarat. He organized relief efforts in the wake of plague, famines, and other natural disasters. He organized bonfires of British goods and promoted khadi clothing. He led farmers in a non-violent revolt in getting the harsh taxes repealed. He worked against alcoholism, untouchability and caste-discrimination. He strived for reforms in the educational system and promoted women’s empowerment. As Ahmedabad’s Municipal Commissioner, he initiated many projects to improve civic amenities. He rose to the leadership of the Indian National Congress, and promoted the Quit India Movement. Patel, like Gandhi was imprisoned several times. He and Gandhi bonded closely while in prison. Patel regarded Gandhi as his elder brother. After gaining Independence, he served as Deputy Prime Minister; Min.of Home Affairs; Min.of Information and Min.of States. He led the monumental task of forging a united India, successfully integrating into the newly independent nation approximately 565 self-governing princely states . His commitment to national integration in the newly independent country was total and uncompromising, earning him the sobriquet “Iron Man of India”. He was instrumental in the founding the Indian Administrative Service and the Indian Police Service, and for his defence of Indian civil servants from political attack; he is known as the “patron saint” of India’s services for having established the modern all-India services system. He is also called the “Unifier of India”. He played a decisive role in introducing key provisions in India’s Constitution. Patel also pledged the reconstruction of the ancient but dilapidated Somnath Temple in Saurashtra, and oversaw the restoration work. He was intensely loyal to Gandhi. Within two months of Gandhi’s death, Patel suffered a major heart attack. His health declined rapidly thereafter and he breathed his last on December 15, 1950. His cremation in Bombay was attended by a crowd of one million including Prime Minister Nehru, Rajagopalachari, and President Rajendra Prasad. Patel was posthumously awarded the Bharat Ratna, India’s highest civilian honor, in 1991. Many public institutions like the Sardar Vallabhbhai Patel National Memorial in Ahmedabad; Sardar Sarovar in the Narmada River Valley;Sardar Vallabhbhai National Institute of Technology in Surat; the International airport of Ahmedabad, the International cricket stadium of Ahmedabad ,to name a few, are named after him. In 2014, Rashtriya Ekta Diwas (National Unity Day) was introduced by the Government of India and inaugurated by Prime Min.Narendra Modi, a commemoration of Patel, held annually on his birthday, 31 October, and known as Rashtriya Ekta Diwas (National Unity Day). This year has added significance as the world’s tallest statue(597 feet), ‘The Statue of Unity’, a monument dedicated to him and located near Rajpipla in Gujarat, will be inaugurated on 31st Oct.2018,by Prime Minister Narendra Modi. P.S. Gujarati Samaj, Atlanta had organized a historic, mammoth and spectacular Golden Jubilee “Swarnim Gujarat’ Celebrations, commemorating 50th Anniversary of Gujarat State,along with the dedication of the bust of Sardar Vallabhbhai Patel, in Sardar Patel Bhavan ,home of Gujarati Samaj,Atlanta, on Septemebr 11 and 12, 2010, with great fanfare. World's first winemaker machine for your kitchen!